This past Saturday (11/4) New England Southern ran round trip service to remove two empty tank cars from 3M in Tilton and replace them with two loaded cars. The empties were brought to Concord and left for Pan Am to take south. After completing their runaround by Silver Lake Road, they headed back south to the 3M Spur to begin their switching operations. 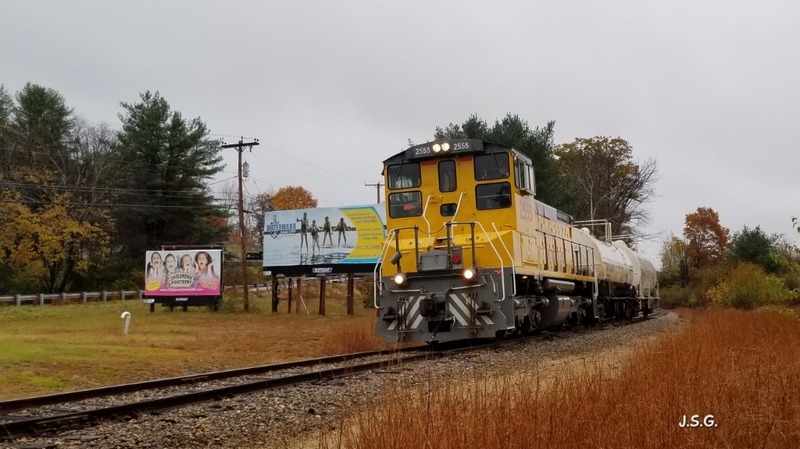 Here was NEGS 2555, their sole SW1500 passing the billboards facing Laconia Road and as they approached the Manville Road crossing in Tilton on a very cloudy day. Photographed by Jay Gadon, November 4, 2018. Added to the photo archive by Jay Gadon, November 8, 2018.